23andme allows you to see if you and another genetic relative share your X chromosome, and the results follow the pattern shown above. See my chart (below, left) to describe the kinships of the five people covered in this example (as this relates to gender inheritance, men are in blue and women are in red). 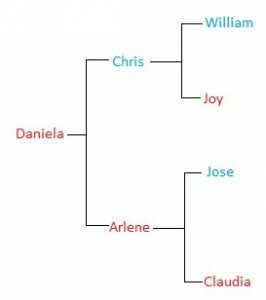 You can see that of Daniela’s two X chromosomes, one is exactly the same as mine and her paternal grandmother, Joy. 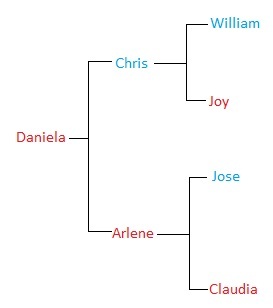 The other is a combination of her two maternal grandparents, Jose and Claudia. 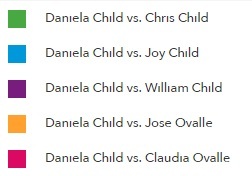 Daniela’s paternal grandfather William has none of his X chromosome in common with Daniela, because two men in a row, the X is no mo’. You can also use this formula if you have relatively close cousins (say first to third cousins) who are not known to you, perhaps through an adoption or another “non-paternity event.” If they share part of the X, this can indicate where the likely common ancestors could or could not be, and the same can be determined if none of the X chromosome is shared. In the example below, my “Child” third cousins have also participated in 23andme. While we all share DNA in common, how our X chromosome compares is shown below. Kira only has some of her X chromosome shared with Sean, as the way they relate is always through two females or one male and then a female. My father, my daughter, and I do not share any of her X chromosome, as our line goes from William to his son Henry, and, thus, two men in a row, the X is no mo’. 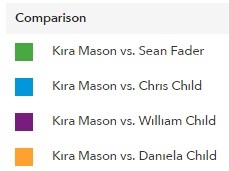 Also, as this is the only way Kira and Sean are related, we know that this shared X chromosome is part of the X chromosome from our great-great-grandmother, Ella (Fitts) Child. So, when taking autosomal tests and you see an unfamiliar close cousin with some X chromosome in common (or none), it is not completely useless to try figuring out your kinship: just remember, two men in a row, the X is no mo’. 23andMe only allows you to compare DNA with five people. WikiTree.com, the free world wide family tree, is making new cousin connections with X matching. As an example, here is my page of DNA ancestors that shows my known mtDNA and XDNA ancestors: http://www.wikitree.com/treewidget/Cooper-1/89 A similar page for a man shows his yDNA ancestors as well. There is also a DNA Confirmation Aid that assists with finding common ancestors, including auDNA cousin connections. Please stop by WikiTree.com to collaborate and help us build the one big family WikiTree. Kitty, I am guessing you did your mtDNA test with FTDNA. Just wondering if you have had any matches with Northern European people who have tested. Most of my heritage is Colonial America, but I get mtDNA matches with several from Northern Europe. What is your Haplogroup? I did a 23andme auDNA test. My brother did a yDNA37 with FTDNA. We have not done an mtDNA test. 23andme says we are W3a haplogroup. The mtDNA info on WikiTree is not based on a test, but is a display of who my mtDNA and X chromosome ancestors are based on placement in the WikiTree family tree. WikiTree does not maintain the actual test results. Instead they maintain the information about each DNA test a person decides to share. I entered the 23andme info on my test page and the yDNA info on my brothers test page. If I understand what you are saying correctly, the statement that your mtDNA is haplogroup W3a is based on posted family tree information. The questions that raises in my mind are these: 1) What is the assurance that those trees were accurately researched and conclusions validated? 2) What if there has been a non-documented birth event (informal adoption, step-child, etc) along the line? These are more common that realized. This sort of thing strikes me as potentially a useful tool for identifying possible subjects to test for comparison, but without that lab test, can you be sure that is your mtDNA haplogroup? How can you confirm relationships without the test? There may be valid answers to these questions that I don’t understand. But based on what I am reading, I don’t see them. Hi Annie, my mitochondrial haplogroup of W3a is based on what was reported in my 23andme auDNA test. The information on WikiTree is based on test information reported from the test participants, not the actual test data. The mission at WikiTree is to create one profile per person for everyone in the world. Then we work together with cousins and strangers on the same profile to improve it with sources, biographies, pictures and information relevant to that particular individual. We know that non-documented birth events (informal adoption, step-child, etc) along the line change the family connections and that the family tree is never complete. 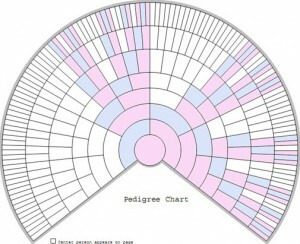 Genealogy is perpetually a theory that should remain open to correction and improvement. WikiTree serves as a repository for all the known information on the 11 million profiles in the database. Take a look at this Thomas Smith profile: http://www.wikitree.com/wiki/Smith-15895 You will see the names of several people who have collaborated to improve the information and you will see the yDNA and auDNA test information for people who claim be his descendant(s). There are currently 1403 Strattons in the database. http://www.wikitree.com/index.php?title=Special:Surname&s=STRATTON&order=name We hope you will join our efforts to improve these profiles with sources and information. Hi Linda, Good question. My mom’s Smiths died out with her father, so I had to go back through the paternal line to find a different line of sons to yDNA test. As it turned out, I had to go all the way back to the immigrant ancestor in the 1600s and then came forward on a different one of his sons to the 20th century. That was the easy part. The hard part is finding a living man on that line. I was fortunate to find an obit that lead me to a 9th cousin in Ontatio who agreed to do the yDNA test for me. So, start with your paternal uncles and male cousins, then your great-uncles and their sons, and work your way back until you find a living man to take the test. This is a great blog post because it relates useful information from which I can learn; thanks, Chris! By contrast, I find many of the Vita Brevis blogs less useful exploration of personal stories worthy of immediate deletion as they relate only to the writer’s ancestry. Chris, to clarify: mitochondrial DNA is indeed different and separate from XDNA. But mitochondrial DNA is inherited by both men and women from their mothers, as it is part of the ovum cellular structure itself. This is why it cannot be used to trace male lines, only female. But a man can use his own mtDNA to track his mother’s female line. Please tell me I’m wrong… My father is the son of my paternal grandfather. I am not genetically related, therefore, to my paternal grandfather’s mother and all that came before her – male or female. 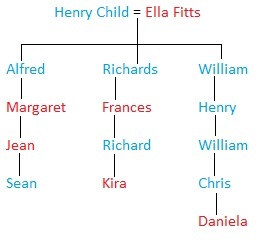 Using your example, Margaret is not genetically related to Henry Child’s mother? Hi Priscilla, The X-chromosome DNA is different from yDNA, mtDNA and autosomal DNA. 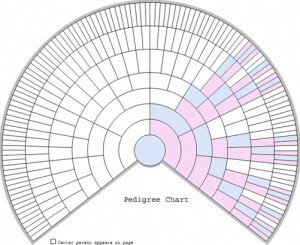 Please compare my X-chromosome ancestors: http://www.wikitree.com/treewidget/Cooper-1/89 with my auDNA ancestors: http://www.wikitree.com/treewidget/Cooper-1/10. Different types of DNA come from different sources and have different family connections. Got it. Thanks. 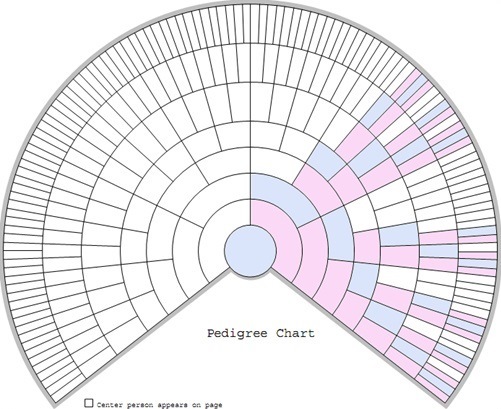 This thread has inspired me to mark my mtDna lines on my working paper circle chart to see where they all end up. There are several very interesting women on the various lines, but I’ve never thought to check if they are connected directly to me through mtDNA. Something to look forward to. Yes, you are genetically related to your paternal grandfather’s mother – with autosomal testing. Y testing is father to father to father back in time. Mitochondrial testing (mtDna) is mother to mother to mother back in time. Autosomal testing is the dna of your MOTHER and FATHER on chromosomes 1-22. Chromo 23 is the X chromo, and has a different inheritance path than Autosomal, and is believed the X has a different threshold according to gender. Thank you. So much to learn. I’m relieved. If I understand this correctly, the X and Y chromosome are only 1 chromosome of the 23, so that leaves 22 chromosomes that deliver genetic material, regardless of gender. Is that correct? Thanks – how could I have forgotten about the other 22 chromosomes? So that means two Xs in a row, no more Y, is that right? Start with the beginners guide, but read and study everything at ISOGG. In time you will become a genetic genealogy hobbyist. Fun and fascinating. I’ll do that. I just signed in to ISOGG. Thanks for recommending it. Very interesting. I keep trying to understand how to use DNA testing to help my genealogy and so read every article I can. Your explanation is easy to follow and understand, thank you for that. Thank you for sharing this source. It will be quite helpful for me. I’ve included this post in my Noteworthy Reads for this week: http://jahcmft.blogspot.com/2015/11/noteworthy-reads-24.html..